The study of capillarity is in the midst of a veritable explosion. What is offered here is not a comprehensive review of the latest research but rather a compendium of principles designed for the undergraduate student and for readers interested in the physics underlying these phenomena. "You are an intelligent spider sitting on your web. Early morning light forms tiny rainbows as it passes through the beads of dew strung along the filaments composing your hard-earned handiwork. Why beads? What happened to the water in between each drop? To answer this question, our eight-legged intellectual must first gain an understanding of how liquids such as water actually wet surfaces and why such liquids fail to wet other surfaces. 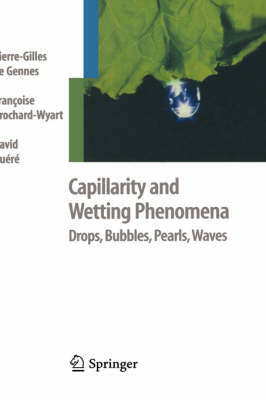 The problem encompasses such subjects as liquids rising up capillary tubes, paint spreading on solid surfaces or liquids spreading on other liquids, the fascinating subject of bubble formation and stability, and why water streams down some surfaces and forms droplets on other surfaces. De Gennes (CollAge ((College) de France; Institute Curie), Brochard-Wyart (Institut Curie), and QuA (c)rA (c) (Quere) (CollAge ((College) de France) have written an excellent treatise on these phenomena that opens with a very poetic introduction relating esoteric concepts to everyday observations, and includes chapter references, historical sketches, and a very good discussion of each problem at chapter beginnings. For readers with backgrounds in mathematics, physics, and chemistry, although it is not beyond advanced undergraduates in the sciences and technological fields. Summing Up: Highly recommended. Upper-division undergraduates through professionals; two-year technical program students."